They work with local farmers to provide quality local beef, pork, lamb and poultry as well as selling game, fish, cheese, hot food, Corn Dolly bakery products and fresh fruit and vegetables. Those vegetables are grown by Colin O’Malley in Loughbrickland. There’s a hot counter with sausage rolls, wraps, sandwiches and other goodies which you can enjoy on site with tea or coffee. Take home a ready-cooked lasagne or pie with some yummy salads. This is a real one-stop shop. This is much more than a butcher’s and with a dedicated car park, what more could you ask for? 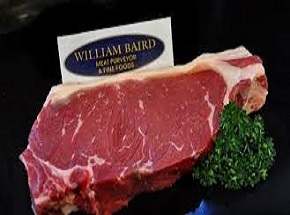 Speciality Sausages, Game, Burgers, BBQ, Fresh fish, Cheese, Salads, Turkeys, Lamb, Beef, Pork and Poultry. Take-away and sit-in hot food.